How long will it take to get paid after I’m awarded in a project? Once you have been awarded, you will work with your client to complete the project wrap-up. This should be completed within 14 days. After the client approves your final files (or the name in a naming project), your payment will become available for payout whenever you are ready. We process payments on business days only (every Monday, Wednesday, and Friday). Payments can take up to 10 business days to reach your account after you schedule the payment. Please be aware that if this is your first win, or if you are a newly registered creative, your payment will be held for 30 days. After the 30 days have passed, you can schedule your payments as usual. In your Account page, there is tab labeled "Payments". This is where you can request award payments, view past award payments and pending award payments. Your Paypal or Payoneer account information lives here as well. You can schedule your payments from the Payments tab as they become available. 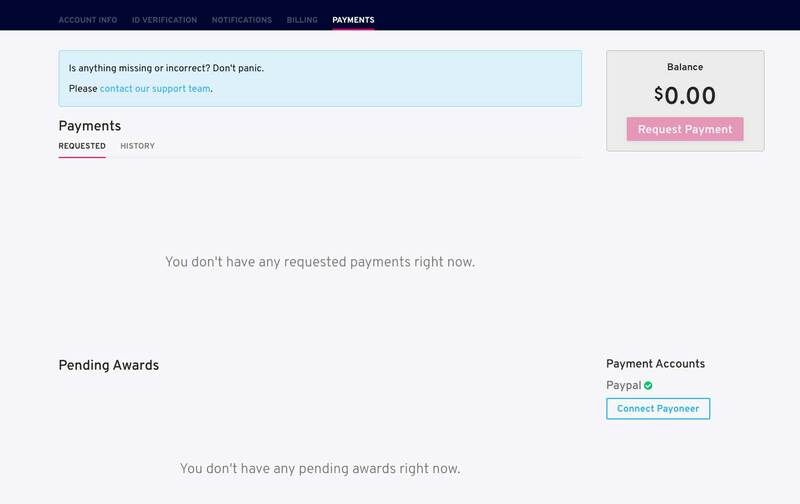 If you've won an award, but the payment is not yet available to be scheduled, you'll see it listed under "Pending Awards" with the date when it will become available. You can be paid via Paypal or Payoneer. There is never a charge to creatives for payments made to your PayPal account. If you do not have a PayPal account, we recommend that you register an account right now. For creatives who reside in a country where PayPal payments are not available, you can choose to be paid via Payoneer. There may be charges applied to your payments via Payoneer. Check with your Payoneer account to learn more. PLEASE NOTE: crowdspring is based in the United States, so payments will not be sent on these major US Holidays: New Year’s Day, Memorial Day, 4th of July, Labor Day, Thanksgiving weekend, and Christmas Day. The payments will be sent out on the next scheduled payment day.